Shri Rajesh Kumar, Dy. 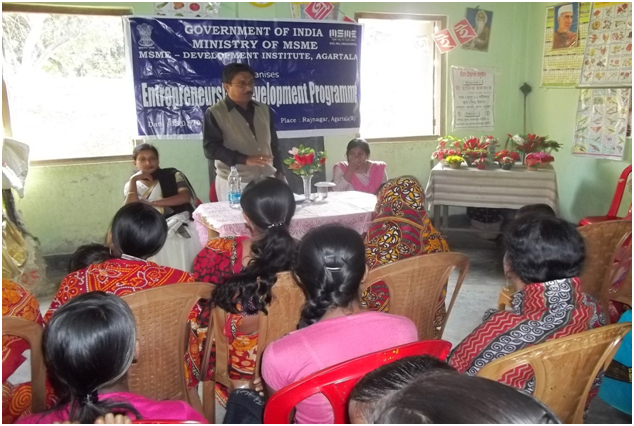 Director (IMT), MSME-DI, Agartala delivering lecture at the EDP (Year 2013-14). 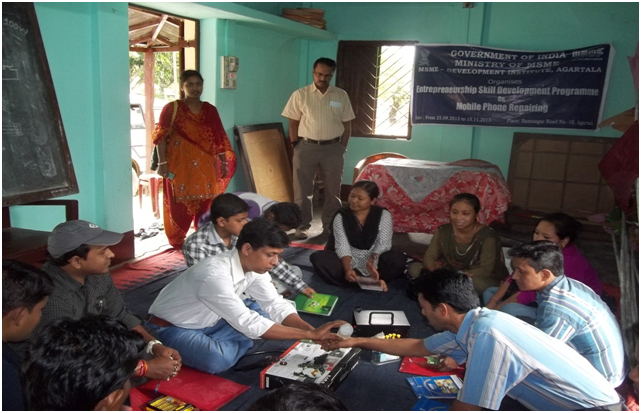 A view of the participants of ESDP on Mobile Phone Repairing organized at Agartala. Shri Rajesh Kumar, Dy. Director (IMT), MSME-DI, Agartala looks on ( Year 2013-14). 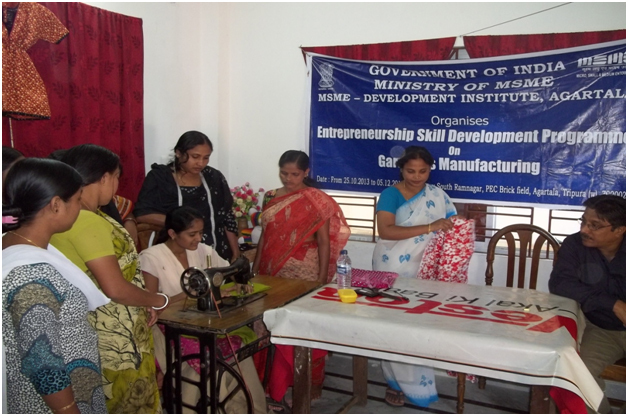 A view of the trainees of ESDP on fancy Cloth Bag Making organised at Agartala (Year 2013-14). 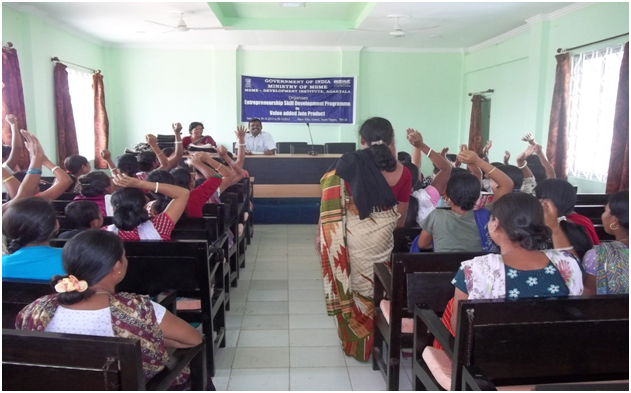 A view of the trainees of ESDP on Garments Manufacturing organised at Agartala. Shri A.K.Mukherji, Asstt. Director (Mech), MSME-DI, Agartala looks on (Year 2013-14). A view of trainees of ESDP on Soft Toys Making organised at Agartala. Shri A.K.Mukherji, Asstt. Director (Mech), MSME-DI, Agartala looks on (Year 2013-14). 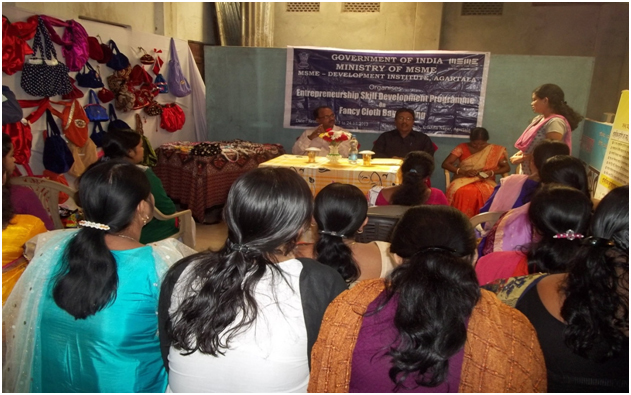 Shri A. Bandopadhyaya, Director, MSME-DI, Agartala at the Valedictory function of ESDP on fancy Cloth Bag Making organized at Agartala (Year2013-14). A participant is giving her views at the Valedictory function of ESDP on Hosiery & Woolen Garments organised at Agartala. Shri A. Bandopadhyaya, Director & Shri Rajesh Kumar, Dy. Director (IMT). MSME-DI, Agartala looks on (Year 2013-14). Shri A. Bandopadhyaya, Director, MSME-DI, Agartala interacting with the participants of ESDP on Mobile Phone Repairing organized at Agartala (Year 2013-14). Shri Rajesh Kumar, Dy. 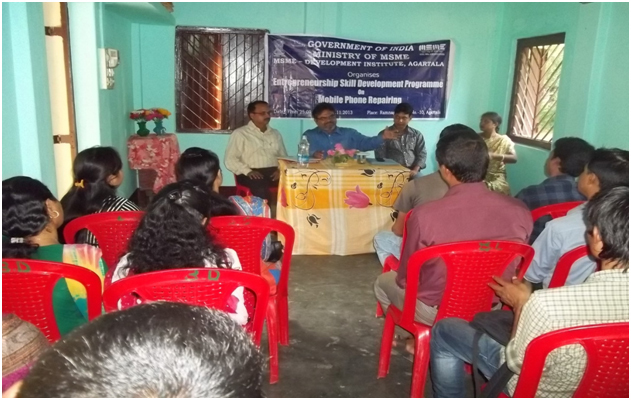 Director (IMT), MSME-DI, Agartala addressing the participants of ESDP on Computer Hardware, Maintenance & Networking at Ranirbazar, Tripura West while Shri A. Bandopadhyaya, Director looks on (Year 2013-14). Shri A. Bandopadhyaya, Director, MSME-DI, Agartala distributing certificates to the participants of ESDP on Soft Toys Making organised at Agartala while Shri A.K.Mukherji, Asstt. Director (Mech), MSME-DI, Agartala looks on (Year 2013-14). A participant is giving her views at the Valedictory function of ESDP on Value Added Jute Products organized at Chanmari, Tripura West. Shri A. Bandopadhyaya, Director & Shri Rajesh Kumar, Dy. Director (IMT). MSME-DI, Agartala looks on (Year 2013-14). Shri Rajesh Kumar, Dy. Director (IMT) & Shri A.K.Mukherji, Asstt. Director (Mech), MSME-DI, Agartala interacting with the participants of ESDP on Fancy Cloth Bag Making organised at Agartala (Year 13-14). 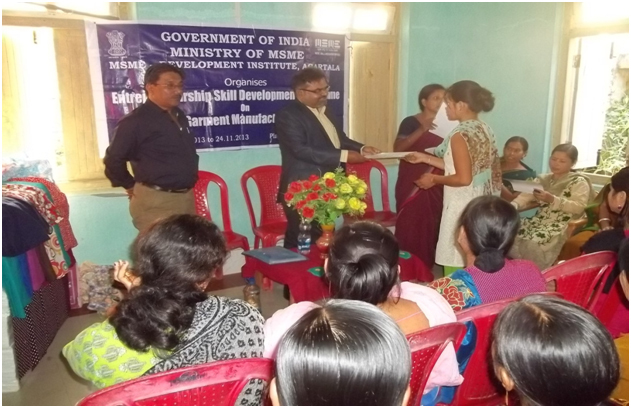 Shri A. Bandopadhyaya, Director, MSME-DI, Agartala distributing certificates to the participants of ESDP on Garment manaufacturing organised at Agartala while Shri A.K.Mukherji, Asstt. Director (Mech), MSME-DI, Agartala looks on (Year 2013-14). 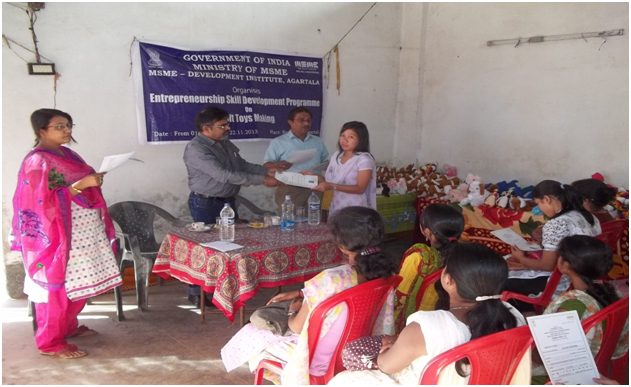 Shri A. Bandopadhyaya, Director, MSME-DI, Agartala distributing certificates to the participants of ESDP on Garment manaufacturing organized at Bishalgarh, Tripura West (Year 2013-14). Shri A. Bandopadhyaya, Director at inaugural function of ESDP on Garments Manufacturing organized at Agartala, while & Shri Rajesh Kumar, Dy. Director (IMT)and Shri D.R.Johari, Asstt. Director (Mech. 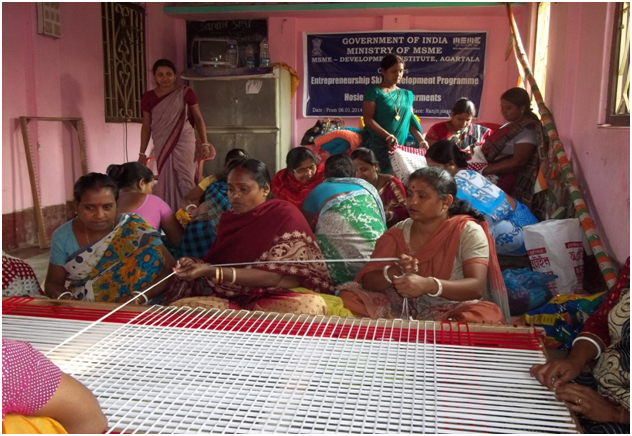 ), MSME-DI, Agartala looks on (Year 2013-14). Shri D.R.Johari, Asstt. 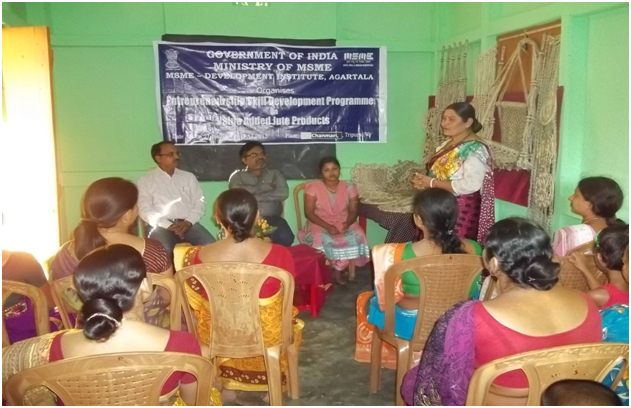 Director (Mech), MSME-DI, Agartala interacting with the participants of ESDP on Value Added Jute Products organized at South Tripura (Year 2013-14). 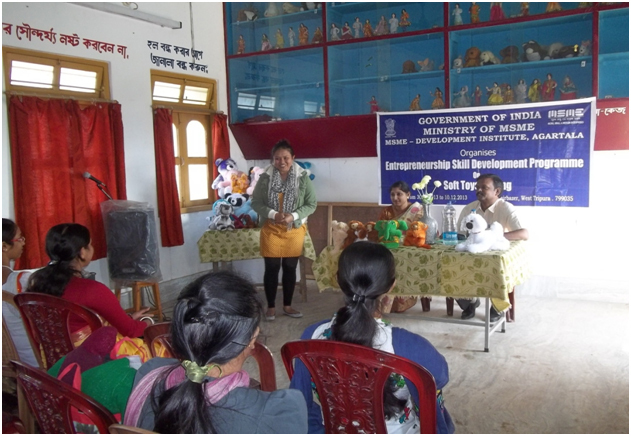 A participant of ESDP on Soft Toys Making organized at Ranir Bazar, Tripura West, giving her views at the valedictory function, while Shri D.R.Johari, Asstt. Director (Mech), MSME-DI, Agartala looks on (Year 2013-14). 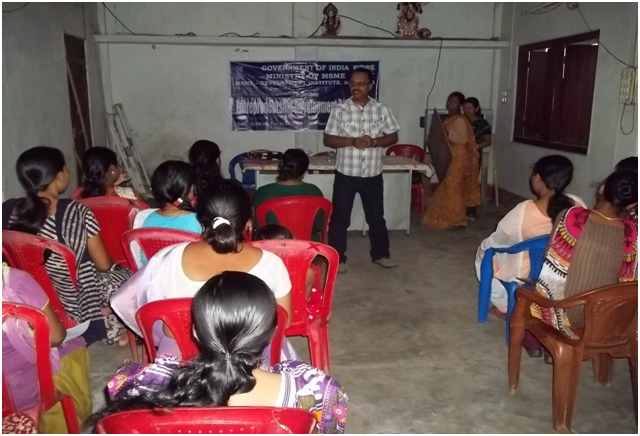 A guest faculty addressing the participants of ESDP on Soft Toys Making organized at Ranir Bazar, Tripura west (Year 2013-14). 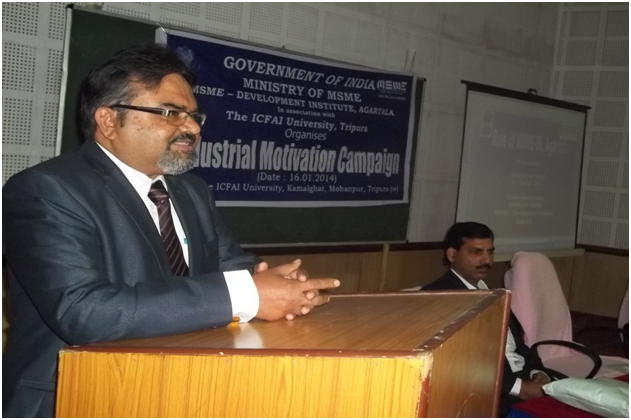 Shri A. Bandopadhyaya, Director addressing the participants of Industrial Motivation Campaign organized at The ICFAI University, Kamalghat, Mohanpur, Tripura West (Year 2013-14). Shri Rajesh Kumar, Dy. Director (IMT), MSME-DI, Agartala delivering lecture at MDP on Financial Management organized at The ICFAI University, Kamalghat, Mohanpur, Tripura west (Year 2013-14). Shri A. Bandopadhyaya, Director, MSME-DI, Agartala addressing the participants of Industrial Motivation Campaign organized at Tripura University, Agartala (Year 2013-14). Shri Rajesh Kumar, Dy. Director (IMT), MSME-DI, Agartala delivering lecture at MDP on Marketing Management organized at Tripura University, Agartala (Year 2013-14). Shri A.K.Mukherji, Asstt. 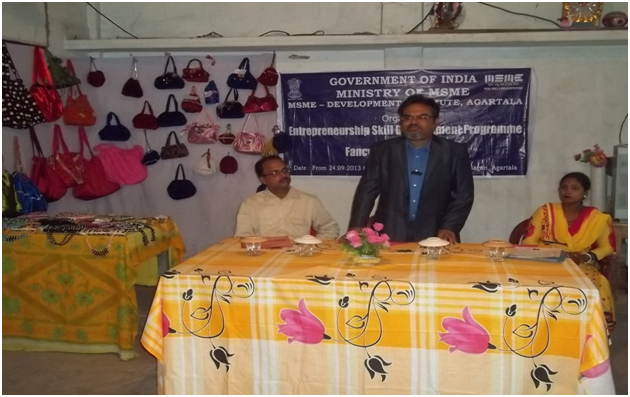 Director (Mech), MSME-DI, Agartala delivering lecture at the EDP organized at Agartala (Year 2013-14). 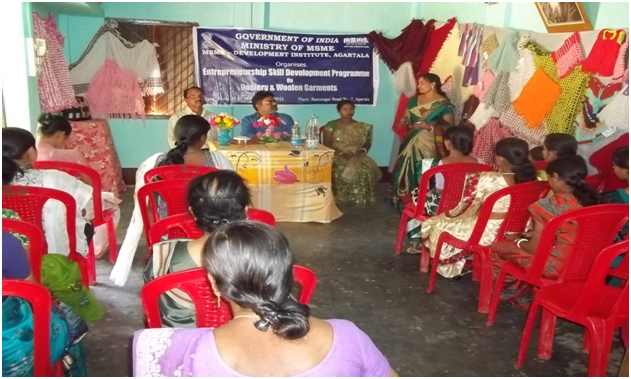 A view of the ESDP on Hosiery & Woolen Garments organized at Agartala (Year 2013-14). Shri A. Bandopadhyaya, Director, & Shri D.R.Johari, Asstt. Director (Mech. ), MSME-DI, Agartala at the inauguration of MDP on Fianancial Management organized at Tripura University, Agartala (Year 2013-14). 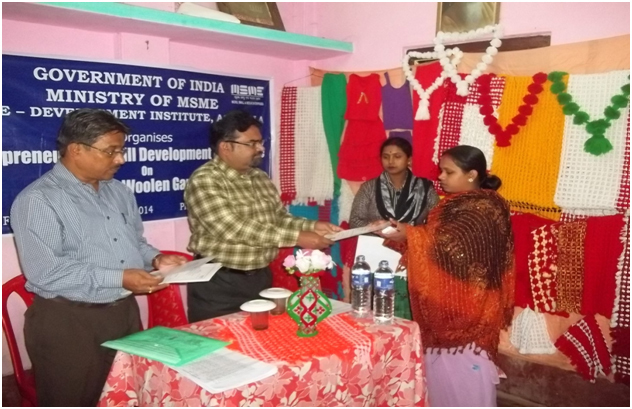 Shri A. Bandopadhyaya, Director, MSME-DI, Agartala distributing certificates to the participants of ESDP on Hosiery & woolen Garments organized at Agartala while Shri A.K.Mukherji, Asstt. Director (Mech. 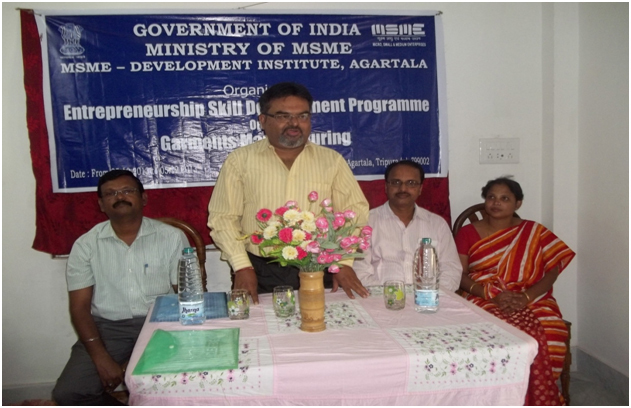 ), MSME-DI, Agartala looks on (Year 2013-14). 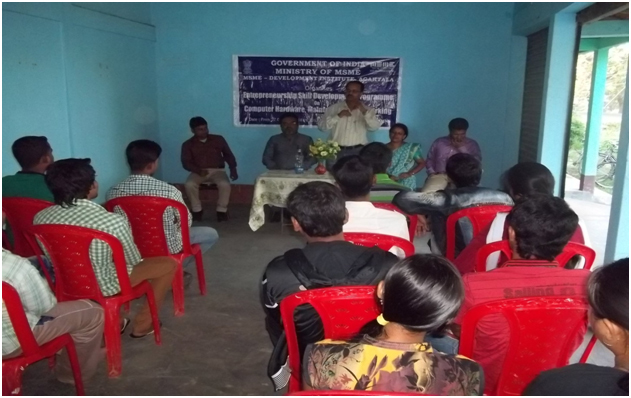 A view of the ESDP on Computer Hardware, Maintenance & Networking organized at Mohanpur, Tripura West (Year 2013-14). Shri D.R.Johari, Asstt. Director (Mech. 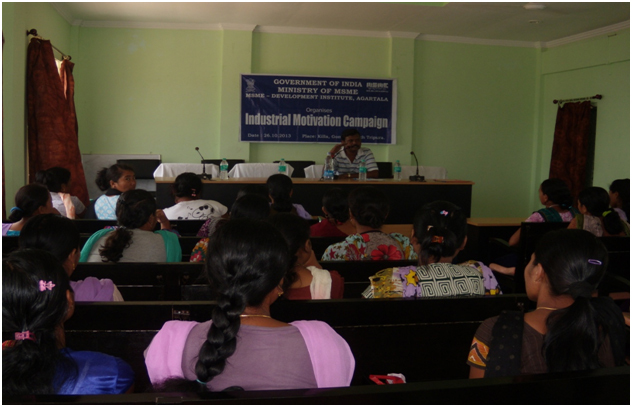 ), MSME-DI, Agartala interacting with participants of Industrial Motivation Campaign organized at South Tripura (Year 2013-14). 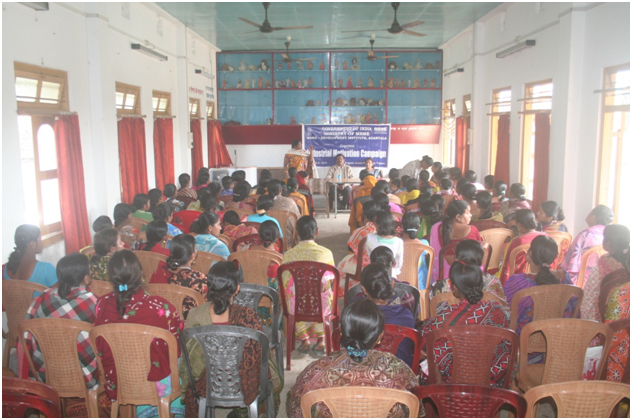 A guest faculty delivering her lecture at the Industrial Motivation Campaign organized at Tripura West, while Shri D.R.Johari, Asstt. Director (Mech.) looks on (Year 2013-14).